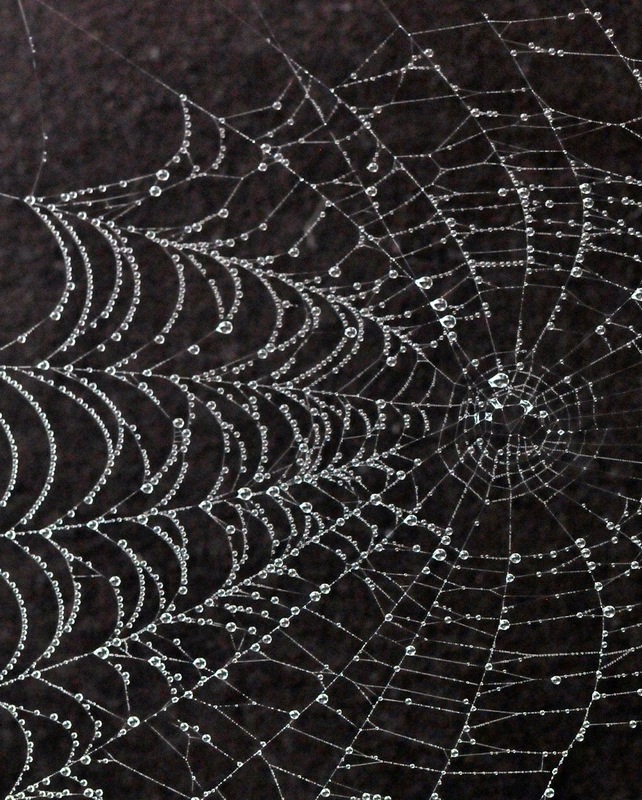 I love orb weaver spiders and appreciate their beautiful webs. I've tried to get photos a few times and they certainly didn't turn out looking anything like this beautiful photo by Wayne Pridemore. Featuring Cole Porter's most famous songs, including “I get a Kick Out of You,” “Anything Goes” and “Let's Misbehave,” the play follows Billy Crocker, a stowaway in love with heiress Hope Harcourt, who is engaged to Lord Evelyn Oakleigh. Meanwhile, Reno Sweeney, the famous nightclub singer and former evangelist, and Public Enemy #13 Moonface Martin try to help Billy. As the sailors and passengers try to entertain themselves and seek out the latest celebrity, a series of mistaken identities combine with Porter's songs and dances to create an exciting and foot-stomping show. 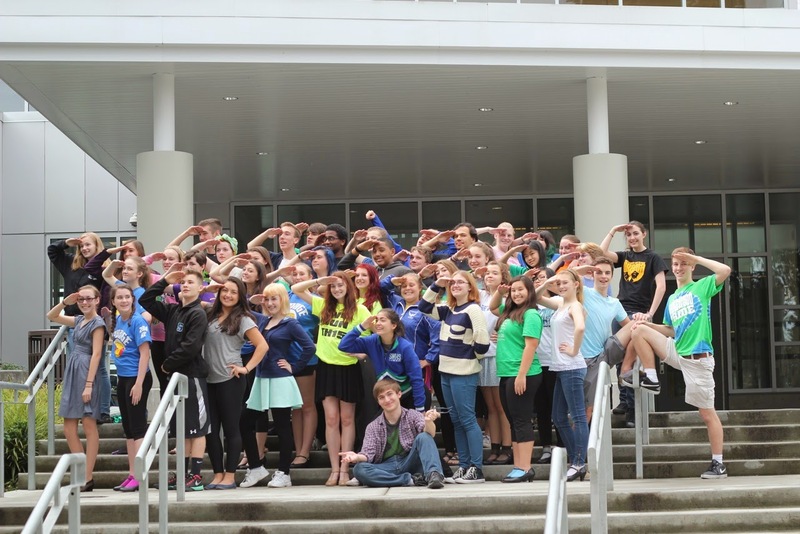 The Shorewood production of “Anything Goes” will be performed Nov 13 to 15 and 20 to 22 at 7:30pm, Nov 16 and 23 at 2pm at the new performing arts center at Shorewood High School, N 175th and Linden Ave N. Tickets are $9 for students and seniors and $12 for adults in advance from Brown Paper Tickets and at the school, and $14 at the door. More information here. 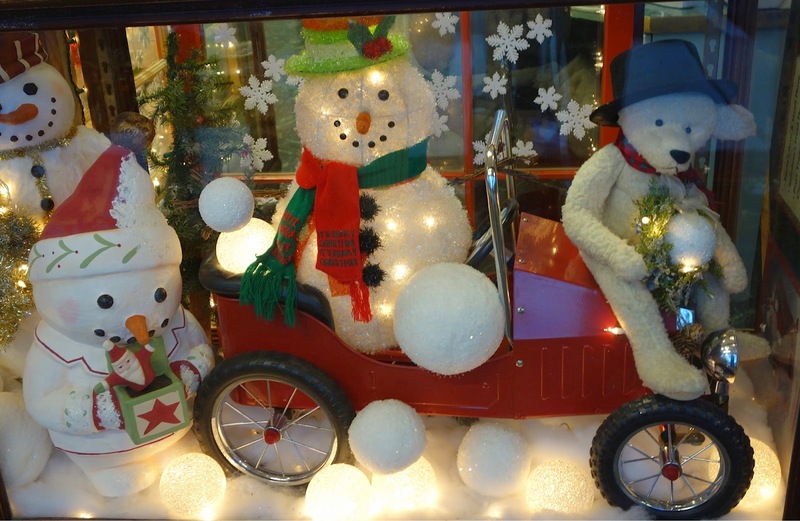 30 year of decorating treasures remain to be sold. 1430 NW 188th, Shoreline WA 98177. The Shorecrest and Shorewood cross country teams will compete Saturday in the Northwest District championships at South Whidbey High School. The meet, including girls' and boys' races in 2A, 3A and 4A classifications, begins at 11am. Shorecrest competes in the 2A race against four teams from the Cascade Conference and eight teams from the Northwest Conference. Shorewood competes in the 3A race against the other 11 Western Conference 3A schools plus Ferndale of the Northwest Conference. 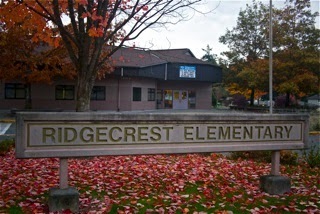 Ridgecrest Elementary in Shoreline has received the School of Distinction Award for a second consecutive year in recognition of outstanding improvement in student achievement over the past five years in reading and math. For example, 89 percent of Ridgecrest fourth graders met standard in reading in 2013-14, as compared to 74 percent in 2009-10, and 77 percent of third graders met standard in math, compared to 60 percent five years ago. 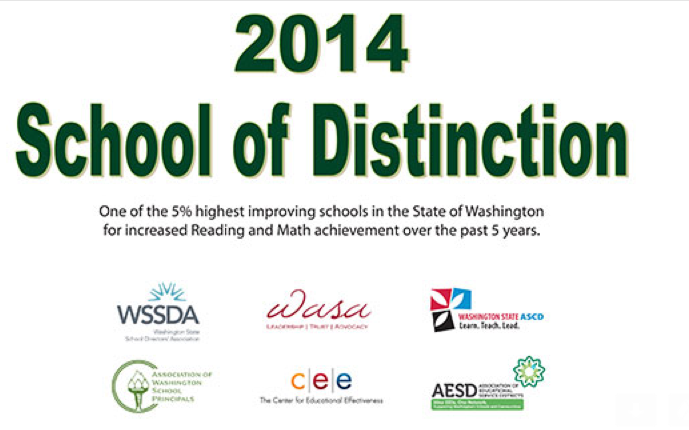 The 2013 School of Distinction award winners include 99 schools statewide. The awards are presented by The Center for Educational Effectiveness (CEE), the Association of Educational Service Districts (AESD), the Association of Washington School Principals (AWSP), Washington Association of School Administrators (WASA), and Washington State School Directors’ Association (WSSDA). In the Puget Sound Educational Service District (ESD) region, which serves King and Pierce counties and Bainbridge Island, 50 schools in 18 school districts are award winners. The agency plans to hold an award ceremony Nov. 5 for the winning schools. 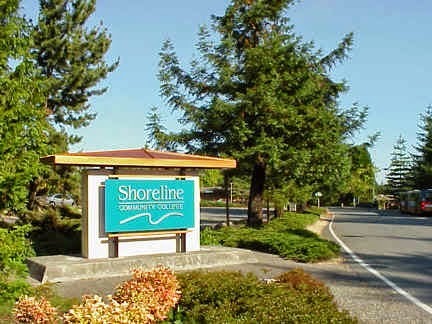 · Joint Meeting with the Shoreline School District Board of Directors: The City Council and School Board members had a productive conversation on the importance of partnership between the two organizations as both are key in continuing to make Shoreline a great community. · Interlocal Agreement with the City of Bellevue for Pooled Funding for Human Services: The Interlocal Agreement updates the pooled funding arrangement between a number of cities and provides for the administrative fee for Bellevue to continue administering the pool. · Ronald Wastewater District Assumption Committee of Elected Officials Update: This was an opportunity to update the full Council on the work of the Ronald Wastewater District Transition Committee of Elected Officials. · 2015 Budget: Discussion focused on Public Works and the Capital Improvement Program. · All of the 32nd District Delegation will be in attendance. This will be an opportunity to hear from the legislators about the State budget, the anticipated issues to be addressed during the legislative session, and to discuss the City’s legislative priorities. · The agenda includes approval of expenses and approval of the 2015 TBD budget. · Proclamation of America Recycles Day: Students and teachers from Syre Elementary School and Parkwood Elementary School will be accepting the Proclamation. In 2013, the Syre Green Team motivated students and teachers to complete the Level 1 Waste Reduction and Recycling goals of the King County Green Schools Program, and actively maintained their Level 1 work in 2014. This year, Parkwood Elementary School completed Level 1 and received the Level 1 award and banner as a King County Green School. After the Proclamation presentation, Recology CleanScapes (RCS) will award $5,000 to each school for excelling in the RCS Waste Reduction and Recycling Program. 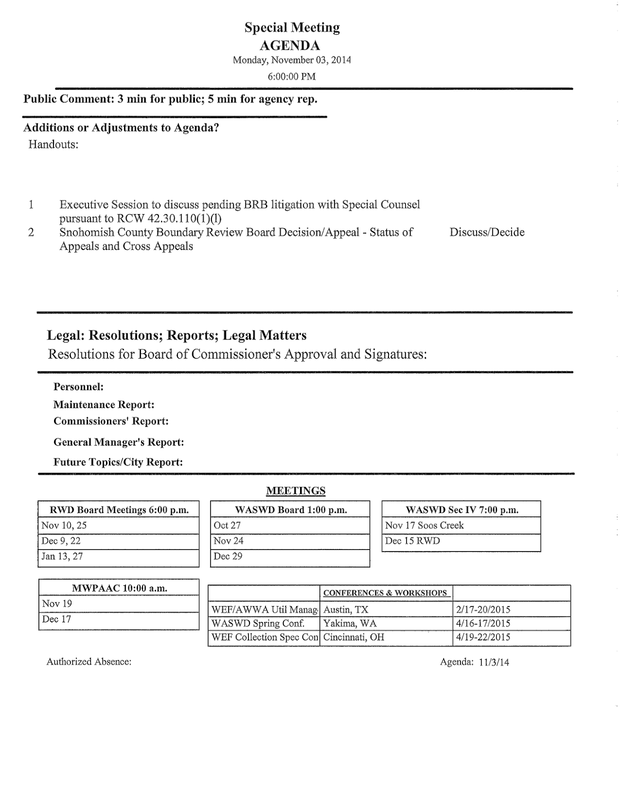 · Adoption of 2015 Legislative Priorities: Council had a preliminary discussion about the City’s 2015 Legislative Priorities at their October 13th Dinner Meeting. Based on the feedback during the Dinner Meeting, staff will present the recommended legislative priorities for adoption. · 2015 Budget Public Hearing: This will be the first Public Hearing on the proposed budget. Staff will also provide a presentation on interfund transfers and the debt service funds. · Discussion of Sound Cities Association (SCA) 2015 Budget and the City’s Membership: Staff was requested by Council to review the City's membership in the Sound Cities Association (SCA) and their proposed increase in dues for 2015. The SCA Board recently voted to propose a membership increase to the 2009 rate of $0.5989 per capita. That equates to an increase of $2,290.15 over Shoreline's 2014 dues of $30,044. For 2015, the proposed SCA dues would be $32,335. SCA represents 36 cities within King County, which equals nearly 1 million people. Along with acting as an advocate for cities at the regional level, SCA appoints members to regional committees at King County, the Puget Sound Regional Council, and other regional committees. The City and Ronald Wastewater District received responses to their appeals to the Snohomish County Boundary Review Board. The O’Neills’ filed their answer to the Supreme Court Petition for Review filed by the City. The City may only file a reply to the Answer if the O’Neills are seeking review of an issue not raised in the City’s review request. Interim City Attorney Julie Ainsworth-Taylor did not see that they raised any new issue, they are just countering the City’s arguments that the award of attorney fees was appropriate. We have yet to hear from the court on their review of the most recent request for fees (we have argued that they should be reduced). · Sales Tax: Total sales tax receipts for the month of September 2014 are higher than the projections by $43,177, or 6.3%, and the year-ago level by $27,730 or 4.0%. Year-to-date receipts are higher than projections by $213,667, or 4.5%, and the year-ago level by $92,212, or 1.9%. Removing one-time construction activity from the calculation reveals that 2014 receipts are higher than projections by 2.1% and the year-ago level by 8.5%. · Real Estate Excise Tax (REET): Total REET collections (collected from the sale of real estate) through September 2014 totaling $1,364,151 are ahead of projections by $9,351, or 0.7%. Total collections for 2014 are ahead of 2013 collections for the same period by 12.1% or $147,523. September and June collections were the only months in 2014 to be lower than 2013 monthly collections. Historically, this seems to be the trend as both 2013 and 2012 saw a large drop in transactions between August and September. The September 2014 transaction amount is six less than September 2013; however, it is 29 more transactions than September 2012. · Development Revenue: Permit revenue in September 2014 totaled $148,348. Total revenue to date is $1,018,638, which is 56.4% ahead of projections and 16.2% ahead of year-ago levels. Issued building permits came in at $6.1 million valuation for September, comprised 48% of residential and 52% of commercial/multi-family valuation. A permit for the Evergreen School Cedar Building was issued with $2.8 million valuation. · Mayor/Representative Farrell: On Monday, October 20, Mayor Winstead, Intergovernmental Relations Manager Scott MacColl, and State Representative Farrell (46th District) met to discuss the City's 145th Street Project and approaches for a bike/pedestrian facility across I-5 to connect to the future Light Rail Station. The Mayor shared the City's work on Light Rail station area planning, Route Development Plan for 145th, and the need for the pedestrian facility. She reviewed the tour and presentation we provided elected leaders and staff in late August, and that Council is supportive with the project moving forward. Rep. Farrell discussed her goal to have WSDOT develop an I-5 plan that includes planning for light rail as part of the budget, which could be beneficial to Shoreline. She is very supportive of the project and understands the need to provide safe passage for bicycles and pedestrians to the future station. She is interested in continuing the dialogue with us as we move forward, and encouraged the City to continue to work with our 32nd District delegation to move the project forward. · Tour of Fircrest Facilities: Last week I joined a few members from the Ridgecrest Neighborhood, along with representatives from Fircrest and former Councilmember Janet Way on a tour of the gym and pool at Fircrest. Some neighborhood representatives are encouraging groups to come together to reopen the Fircrest pool. A cost estimate of repairs and operating costs of the pool was provided. This estimate would need additional analysis prior to any consideration for reopening and operating the pool. · October 28, King County Youth Action Plan, 6:30 to 8:00 p.m. The City and County Councilmember Rod Dembowski jointly sponsored this event to gather input from Shoreline and North King County youth, parents, and others that work with youth on development of the County's Youth Action Plan. We had a great turnout. · Staff participated in our annual Emergency Operations Center Exercise on Wednesday, October 29. Sadly the scenario was a school shooting incident. The Board of Commissions of Ronald Wastewater District have announced a special meeting to be held on Monday, November 3, 2014, 6pm at the District headquarters, 17505 Linden Ave N, Shoreline, 206-546-2494. Notice is hereby given that the Shoreline Fire Department will be holding a surplus sale to dispose of excess tools, equipment, and supplies. Items at the sale are either pre-priced at disposal prices or are available for bid by silent auction. 1. Items listed at “bid” price will have a bid sheet attached. 3. Persons wanting to place a bid on the item shall write their name and phone number at which they can be reached after 2pm of the day of the sale, and their bid price. 4. Beginning at 2pm, bid sheets will be collected by a Department official. Once the sheet is collected the bidding shall be considered closed. 5. If parties are involved in bidding, or attempting to bid as the sheet is collected, each interested party may verbally submit a bid to the Department official. 6. The highest bid accepted by the Department official at that time shall be considered the sale price. 7. Upon collection of bid sheets, the top bidder for each item shall be contacted by phone (after 2pm), or in person if they are present. If the top bidder is not reached by phone (or person) after the first attempt, the next highest bidder shall be considered the highest bidder. 8. All Silent auction items are to be paid for by 4pm, or the top bidder shall be disqualified and the item shall be offered to the next highest bidder to purchase by 5pm. 9. Any remaining items not bid upon at the minimum bid shall be retained by the department for possible later sale or disposal. 10. Any disputes shall be resolved by the Department official and his decision shall be final. All items are sold “as is” with no implied or actual guarantees or warranties. A new Halloween-themed computer game from the University of Washington Bothell uses ghosts and goblins to hit the mark in family fun and higher education, while serving as a model of team diversity. 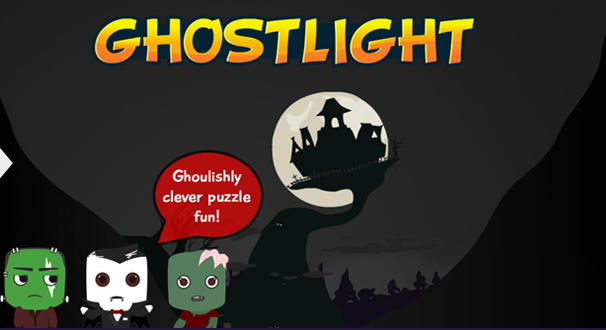 “Ghostlight is a new style game that harkens back to the time when games were about puzzle solving,” says UW Bothell’s Digital Future Lab executive director Jason Pace. In fact, puzzle solving and education are at the core of Ghostlight. While Sung’s team quickly developed simple game-themed teaching materials, it became obvious that higher quality games were needed to significantly improve results.“We needed talents from commercial, aesthetic, and creative disciplines to complement our mostly academic, technical, and computer science-based research group,” says Sung. Sung began piecing together the puzzle, which included a collaboration with Pace’s team. “Jason’s team and additional funding from the National Science Foundation arrived at precisely the perfect moment.” Sung added, “Soon after we started collaborating, Ghostlight was born”. Pace’s background in human-computer interaction and game design at Microsoft, including a number of creative leadership roles in 343 Industries (the Microsoft studio currently responsible for the Halo franchise on Xbox) and MSN Games, provided him with the opportunity to explore in depth how aesthetic design can be used to elevate interactive digital experiences and capture the imagination of users. Both Pace and Sung captured the imaginations of everyone involved in the game development process. Undergraduate students comprised the majority of the project’s contributors, including artists, musicians, sound designers, puzzle makers and programmers. Half of the contributors were female. After spending several months becoming fluent in common casual game types, the team began innovating in ways that were at once interesting, yet well within their ability to deliver. While the game began with a goal of providing entertainment and educational value, Pace brought other equally important goals and all of the pieces are there. Ghostlight meets high quality industry standards, it adheres to the Digital Future Lab’s moratorium on game aggression and violence, the development involved a collaborative effort that reflected the UW Bothell experience, captured students’ imagination and involved high level critical thinking – a skill students can take into the classroom and their professions. Both Sung and Pace agree that Ghostlight and other games being developed through this collaboration are densely packed opportunities for both faculty and students to explore art, design, and technology. They are hopeful that can secure a new round of funding that will allow the team to develop Ghostlight for mobile as well as other games. “We believe our unique production environment – a model that includes the same kind of multi-disciplinary teams and diverse skillsets found in many technology companies -- has allowed us to significantly raise the bar for what undergraduate teams have traditionally been able to deliver,” says Pace. 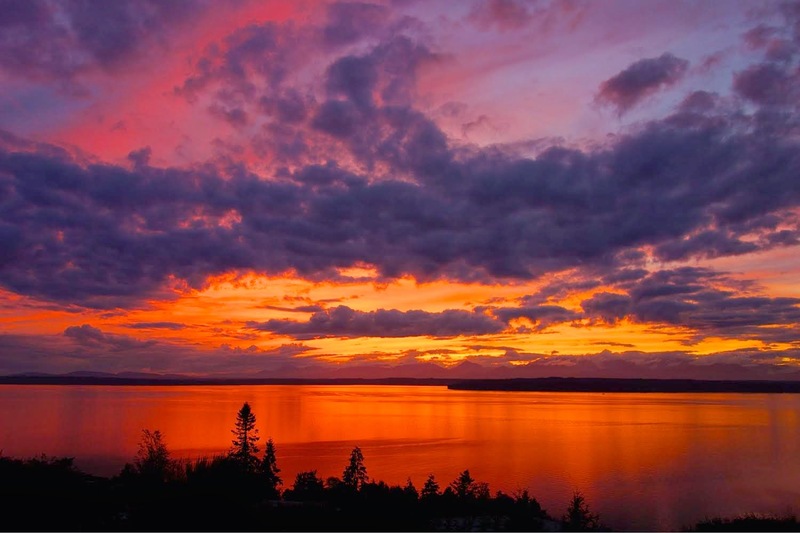 Lee Lageschulte took this shot on the evening of October 29, 2014. Fair warning: We will be changing our clocks before we go to bed Saturday evening. Spring Ahead - Fall Back. On Saturday, November 1, weather permitting, the contractor will grind and pave the entire west half of 25th Avenue NE from the north side of the Shorecrest north driveway to the south side of the south driveway. Paving is expected to start at the north end of north driveway around 10 a.m. There will be flaggers directing traffic. The south driveway and the student parking lot south of the Shorecrest gym building will be closed completely at the end of the day on Friday, Oct. 31, and demolition of both will begin Saturday morning. After school and weekend events that utilize the gym and/or the athletic fields will have to park elsewhere on the campus in the north or central lots. Student parking will be temporarily relocated to the central and north lots. We are hopeful that the remaining new parking lots will be open by Dec. 1. Thank you for your continuing patience as we complete the new Shorecrest campus. If you should have any questions or concerns, please let us know through the Shoreline School District Public Information Office at 206-393-4412. Accidental fires are devastating and heartbreaking. As we approach the winter months, review basic fire prevention rules with your families and do a fire safety survey of your home, Lots of great information for including children in this effort is online. Most important thing you can do to protect your family? When no one is at home to hear it! 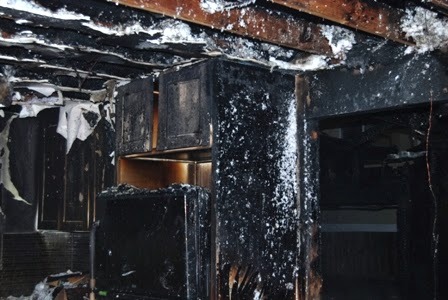 There were two house fires in Shoreline this week where smoke alarms could not make a difference. Both were fires with severe and costly damage. Both with significant fire safety lessons learned. 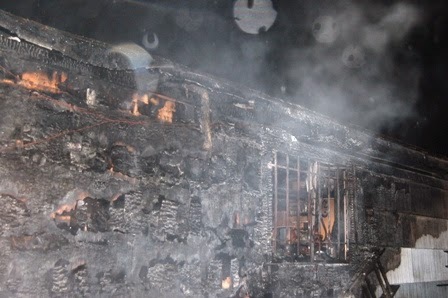 One was caused by an unplugged smoker, that was still hot enough to ignite something on the exterior of the house. Flames tore up the siding, spread to the attic, and were blown by winds into the house next door. The second destroyed a vacant home being extensively remodeled. Cause? Someone left mineral oil-soaked rags (from a floor refinishing project) crumbled up in the garage. Shoreline Firefighters quickly extinguished both fires, and protected the next door exposures. But the fires were not reported until they were seen by passersby, and had become fully involved structure fires. Shorewood will be the host team for two Northwest District 3A volleyball tournament first-round matches Saturday afternoon. The top-seeded Thunderbirds take a 10-5 season record (10-2 Western Conference 3A) into a 5pm match with Glacier Peak. Ferndale and Oak Harbor meet in another first-round match at 2pm Saturday, also at Shorewood. The four teams return to Shorewood Monday for second-round matches. The tournament includes the top seven Wesco 3A teams plus Ferndale of the Northwest 3A/2A/1A Conference. Ferndale qualified for the tournament because it had a better conference record than the No. 8 Wesco 3A team. Four other terms play Saturday and Monday at another site. The tournament continues Nov. 6-8 in Marysville. Are you a cat person, or a dog person? Choose a number between 1 and 100. For reasons he (and the reader) do not understand, Wil Parke has been attacked in an airport restroom, asked several nonsensical questions, and then kidnapped at gunpoint by an enigmatic man who calls himself Tom Eliot. In a time shift, street hustler Emily Ruff is asked the same nonsensical questions and eventually recruited to a mysterious organization that promises to teach her to be more persuasive. How do these things come together? Using a volatile combination of action sequences interspersed with scientific (but never boring!) 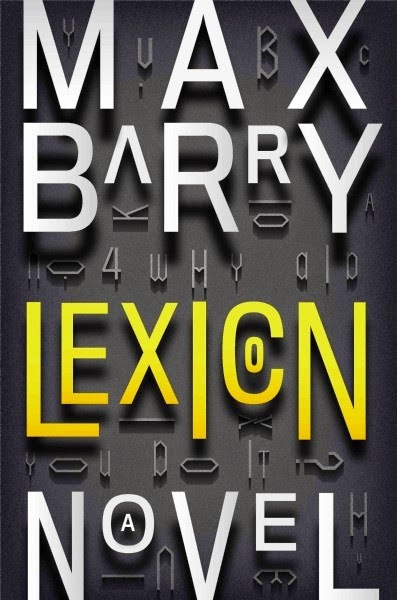 explanations about brain research and neuro-linguistic programming, the author drags the reader deeply into this deeply violent, disturbing story of modern life and the power of words as weapons. This book was included on the 2013 School Library Journal "Best Adult Books 4 Teens" list. It will definitely thrill some teens, but readers are warned that violence and cussing completely saturate the story. Recommended for readers who can survive the cussing and who enjoy action, suspense, and contemporary dystopic fiction. The 50-year-old pedestrian bridge in Saltwater Park will be closed in early January for structural repairs and upgrades. The repair work is expected to take approximately six to eight weeks and will require complete closure of the bridge and beach area, including the off-leash dog park. Repairs include replacement of the bridge deck, railings and minor repairs to the substructure. The repairs are necessary to maintain a safe bridge and allow continued access for emergency and maintenance vehicles. Completion of these repairs will extend the life of the bridge by 20 or more years. For more information see the City webpage. 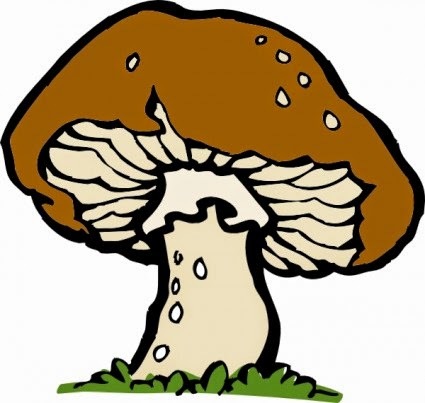 Join other plant (or in this case mushroom) geeks for an exploratory wander through the garden looking for mushrooms. Bring a field guide if you have one (they will have some on hand), to see what you can find and identify. Beginners welcome. Cost: $10/person, free for KBGF members. With programs that draw from across the state, country and globe, Shoreline Community College continues to look for ways to help students meet their needs for housing while getting the education and training that can change their lives. Roberts said that details of any arrangement must make financial sense for the college and the state. “We’re a state agency and need to make sure we’re good stewards of the public’s money and trust,” she said. The college also has to be cognizant of its effects on immediate neighbors, the city and larger region. Currently, the college works with three independent agencies to arrange homestay opportunities for international students. There is also a list of housing resources available to both domestic and international students. However, none of those options is directly overseen by the college. College officials have been looking at a variety of housing options for the past several years. One possibility arose in 2011 with an offer from local and international investors to build a residence hall on campus. While that project may remain a possibility, a recent discussion with the investors’ representatives explored other opportunities while reinforcing the desire on all sides to continuing working together. “Off-campus housing solutions are also a possibility,” Roberts said. Recent discussions for off-campus housing didn’t bear fruit, but Roberts said the college remains open to a variety of housing options. “We’re open to ideas that meet the needs of students, the college and the community,” she said. Leasing of existing housing by the college to make available to students is also a potential solution and could come more quickly than options that include the longer timeline of construction. While the college is interested in housing, either on- or off-campus, the parameters for each differ. An off-campus project requires finding available land, a willing seller, etc., while an on-campus facility would go on property owned by the state of Washington. A key piece of the regulatory groundwork for building on campus was put in place in June, 2014, when a Master Development Plan (MDP) was completed with the city. High school soccer playoffs are upon us, and what better way to open the District One 2A and 3A tournaments than a pair of games involving the two local girls soccer teams at Shoreline Stadium on Saturday November 1. Shorecrest, the regular season WesCo champs (11-1-0 in league play, 9-3-3 overall) squares off against Sehome (8-1-3, 9-3-3) in the 6pm opener, while Shorewood (7-2-3, 8-5-3) hosts Stanwood (5-5-2, 7-5-3) at 8pm. Shorecrest impressively won the 3A league title in spite of being a smaller 2A school, with their only league loss coming in Wednesday's regular season finale at Glacier Peak, 1-0. The Scots have been led in scoring by speedy junior Sophia Viviano's eye-popping 21 goals, while veteran back-line defenders Alex Murphy, Mackenzie Parry, Kayla Holland and Sydney Coe have helped make life easy for Keeper Kate Wiper. Junior Alexa Iacalucci aggressively patrols the midfield with aplomb, and she, too, is a scoring threat, as evidenced by her 7 goals. Viviano is making a case to be the next great soccer player to come out of the Shoreline School District, a list that includes SC grad Michelle Akers and SW grad (and SC assistant coach) Lori Henry, both Women's World Cup champions. Shorewood follows in the nightcap starting at 8pm as they play Stanwood, a rematch of a 1-0 SW win over the Spartans on October 16. Senior Siena Helland leads the T-Birds in scoring with 9, while junior midfielder Lisa Jensen has a knack for always knowing where the ball will be going next, as well as an uncanny ability to find open teammates and pass the ball to them. After Saturday's matches, the 2A tournament will be played at Shoreline Stadium, while the 3A games will be held at Arlington HS. Brackets and game schedules can be found online. Turn out those closets! This is the best opportunity you will have to donate items instead of putting them in the landfill. Shorewood Orchestra is holding a clothing and household textile drive to raise money to send the school orchestra to Carnegie Hall - an opportunity that only comes once every four years. Working with a company called Clothes for the Cause, the orchestra will be paid a sliding scale for each pound of clothing and household textiles collected. The more that is collected, the more Orchestra will be paid per pound. Bring your donations to Orchestra's collection event on Saturday, November 1 from 10am to Noon at the Shorewood High School parking lot. What's great about this collection drive is that the clothing and textiles do NOT need to be in usable condition. This company will sort through and separate what can be reused and what will be broken down and recycled. Either way, Orchestra gets paid. Items can be torn, tattered, stained, holey, smelly, stretched out and ready for the garbage can. All those items too grungy for Goodwill can be turned into cash for Shorewood Orchestra! All you have to do is pack your donations into plastic garbage bags so that they stay dry. You don't have to separate usable from unusable items -- the company does all that for you. glass, breakables, electronics, pet beds, bed pillows, carpet, uniforms, mattresses, hotel linens, items previously for sale at a thrift store (unless you purchased and used for personal use prior to donating). The results of the latest KCTS-9 Washington Poll are now posted online at the KCTS website. The poll interviewed 602 registered voters statewide and asked prospective Washington voters how they planned to vote on three statewide initiatives I-591, I-594 and I-1351. The poll also queried voters on their views towards Governor Inslee, the state legislature and major policy issues facing the state. Overall the poll finds very strong support for Initiative 594 regarding background checks for gun purchases and very strong support for Initiative 1351 which would require fewer students per classroom. Both initiatives have broad support statewide and appear on their way to being passed. In contrast, Initiative 591 has far less support 41.7 percent saying they will vote yes and 38.8 percent saying they will vote no. Governor Inslee enjoys fairly high approval ratings with 53.8 percent holding a favorable view compared to 28.9 who had an unfavorable view, a net advantage of 25 points. The poll also examine favorability towards Senators Cantwell, Murray and many 2016 contenders from Hillary Clinton to Chris Christie and many more. When it comes to voting in elections for the U.S. Congress, statewide 44.7 percent plan to vote Democrat while 39.0 plan to vote Republican. In terms of the Washington state legislature, respondents were asked which party they trust more to make the right decisions and improve economic conditions in the state. Overall 40.9 percent said they trust Democrats more while 35.2 percent trusted Republicans more in Olympia. The poll also asked Washington voters their views on major policy issues facing the state including education funding, minimum wage, immigration, health care, and policing. Full poll results can be found online at the KCTS-9 website.